OMG I cannot stop eating this pie long enough to write this blog post! This has the most amazing perfect lemon flavor: not too tart, and not too sweet...the flavors are in perfect balance and harmony with each other. The texture of the pie's filling (which might seem a little odd at first) is jello-like at first bite, but then coats your mouth with a soft, creamy, cool consistency. 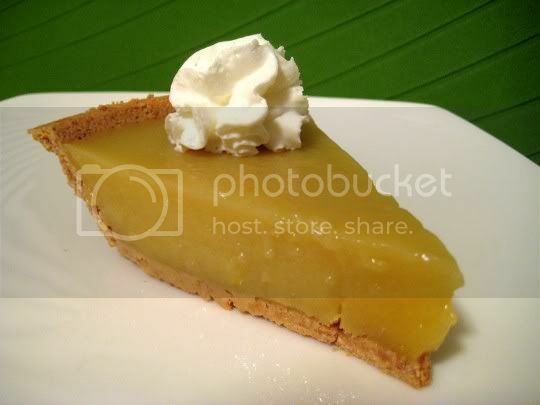 A sweet graham cracker crust, plus a little fresh whipped cream on top, contrasts nicely with the extreme lemon flavor. Now, one word about making this. It's a lot of work...but trust me, it's worth it! You'll need a cup of fresh lemon juice, so get ready to juice about 3-4 large lemons. Then get ready to zest about one whole lemon. Then get ready to whisk eggs. And then get ready to whisk some more...a lot more. Essentially, you're making a lemon curd (yum! ), a sort of soft cooked custard, and thus you'll be whisking for a very long time. From putting the curd on the stove over low heat to it being thick enough to leave whisk marks, it took about 10 minutes...and that was after I eventually turned the heat up. So yes, get ready for your hands and wrists to ache...but you will be glad in the end! Once the curd is poured into the crust, it will need to cool on a wire rack, and then completely chill in the fridge. So it's best to make this the night before you plan on serving. Make again? DEFINITELY. This is a no-fail, please-everyone dessert recipe. Oh, and did I mention it's low fat?!?!?!? !